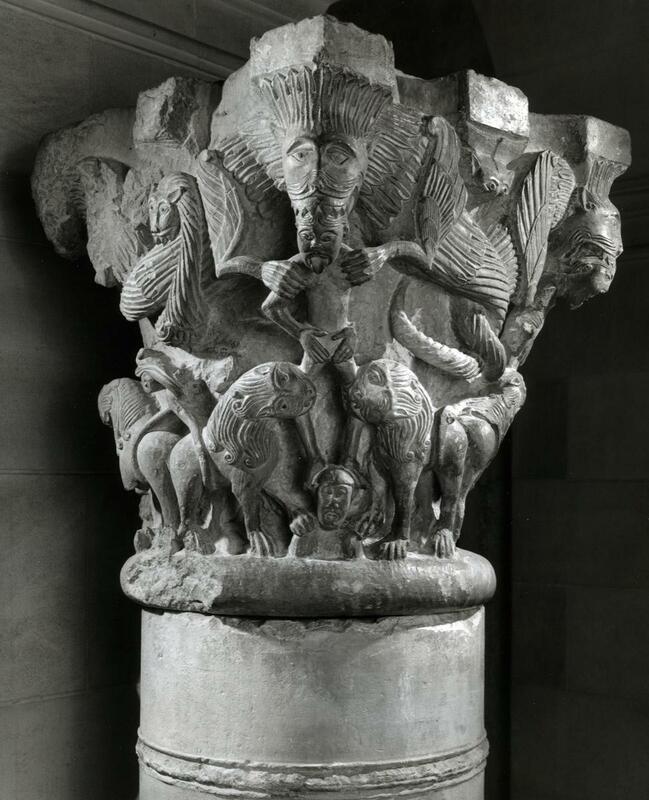 This capital, once part of a column in the nave arcade of Notre-Dame de Montermoyen (now destroyed), is a clear statement of the revival of monumental stone carving after almost seven centuries of neglect. Inspired in part by the vestiges of acanthus-leaf capitals of Roman architecture, the medieval carver has replaced the classical leaf forms with monstrous animals and humans like those that appear in twelfth-century books and wall paintings. On the lower range of the capital are facing lions, each munching a leg of a pathetically naked man who is also being seized from above. A monster setting its teeth into his skull displays its double body on two sides, submitting to the strict geometry of the capital's shape. As the monster ultimately dissolves into a serpent's tail, it becomes entwined with the tail of a similar beast so that the ghoulish feast continues without a break on all four corners of the block. While to a twentieth-century eye, the monsters may seem threatening, the renowned twelfth-century cleric Saint Bernard of Clairvaux betrayed a certain admiration for such imagery of "fierce lions . . . a four-footed beast with a serpent's tail . . . many bodies under one head . . . marvelous and deformed comeliness (and) comely deformity."